Blanch the lime zest (dip for a minute in boiling water then transfer to an ice bath). Repeat twice. This helps to lower the bitterness of the fruit. Drain and pat dry the lime zest with a paper towel and finely chop. Set aside. Juice the grapefruit. Be sure to remove the pulp, using a strainer. Place the grapefruit juice in a small saucepan. Bring to a boil, then immediately lower the heat to a gentle simmer for about 5-6 minutes. The liquid should reduce to about 2 tablespoons of grapefruit juice. Remove from the heat. In a mortar and pestle, grind the lime zest, chipotle peppers and 2 teaspoons of garlic into a paste. Add the corn syrup, ginger garlic paste, Worcestershire sauce, concentrated grapefruit juice and lime juice. Reserve about 3 tablespoons of marinade in a small bowl. Clean and skin the sea bass. Pat dry using a paper towel. Place the fish in a small, deep dish. Season with salt, cayenne pepper and the garlic lime marinade. Spread the mixture all over the fish. Make sure all the marinade penetrates and coats the fish. Drizzle with 1 tablespoon of olive oil. Plastic wrap the dish and refrigerate overnight. The next day, preheat the oven to 375°F. Remove the fish from the refrigerator 15 minutes before cooking to bring it back to room temperature. Remove the fish from the dish and pat dry the excess garlic lime marinade. Season with more kosher salt. In a non-stick pan that can be used in the oven, heat 2 tablespoons of oil and cook 2 cloves of garlic until it is slightly golden. Add the fish and sear it. Cook for about 6-8 minutes. Flip the fish using a large spatula. Cook for another 2 minutes. Using a silicone brush, baste the fish with the rest of the garlic lime marinade . Immediately transfer to the oven. Bake for 6-8 minutes until golden. The marinade should be totally absorbed. Baste the fish one more time with the rest of the garlic lime marinade. In another pan, heat the rest of olive oil. Sauté the onions in the oil for about 3-4 minutes over high heat, stirring frequently to prevent the onion from burning, until the color is evenly golden brown but the onions are still crunchy. Season with salt. Transfer to a platter. In the same pan, add the sliced orange bell peppers and toss them until they soften. Season with salt and black pepper. Add the caramelized onions, capers, sweet basil and reserved garlic lime sauce. 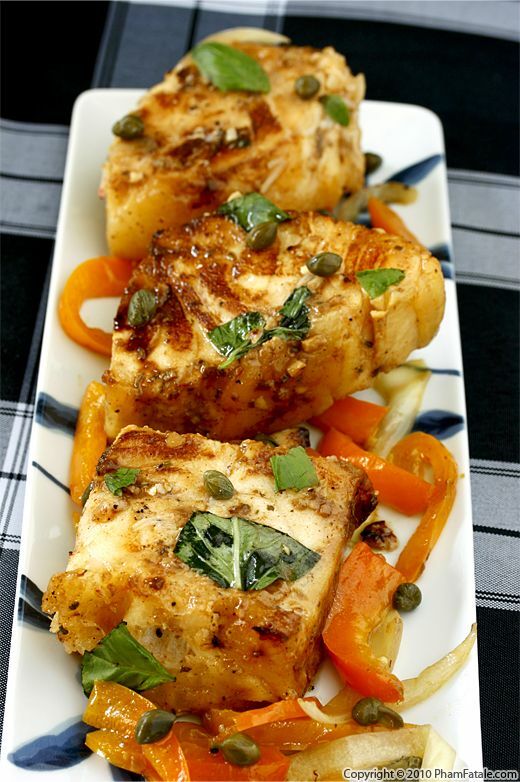 On a serving platter, lay the medallions of sea bass on a bed of the bell peppers and onions. Garnish with lime wedges. Serve immediately.